Hi, my name is Cindy Weddle, and I’m Linda’s daughter-in-law. I’ll be blogging a bit about my hometown, Rhinelander, WI, where I have lived with my husband, Jeff, and three children for ten years. The biggest thing Rhinelander has going for it is the natural surroundings. We are surrounded by forests (my favorite smell is of pine needles in the sun), and deer (who will NOT get my perennials this year due to a horribly smelly batch of deer repellent), and lakes. 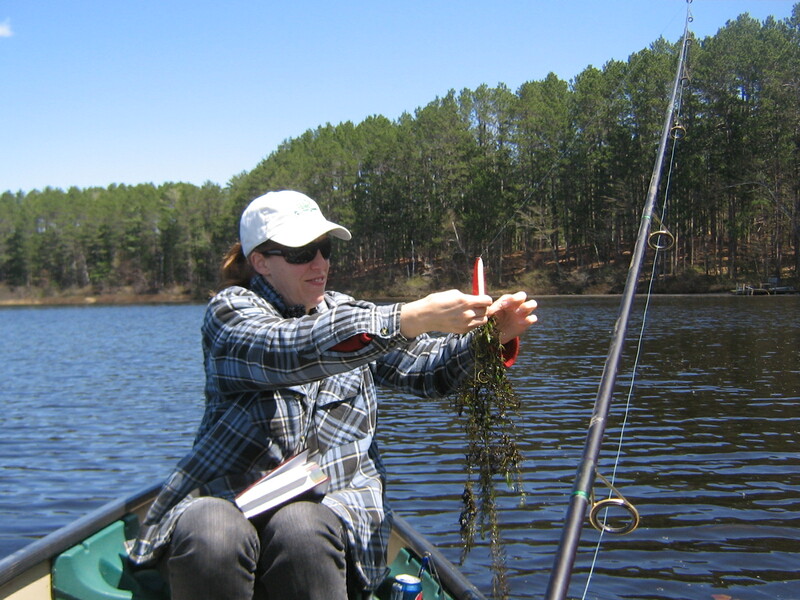 If you’ll notice the goofy picture of me (yes, I am wearing my husband’s plaid jacket), we like to take advantage of the fishing. In the summer we hike the trails across the lake. Though this is “technically” trespassing, we bring children so as to blame it on them. All in all, it is a very pretty place to live and raise our children. I’ll deal with a few nonsensical fears in order to live in a place like this. . . although did you hear about that lady who, while taking out her garbage, got attacked by a bear? I’m just saying. Cindy!! Very cool. I’m so looking forward to hearing about how great it must be to live in the shadow of such a great man. I’m speaking, of course, of your son, the push-up champion of the world. Hi, Cindy! Great first post…I like your final words – I can tell you put a lot of thought into them and I think they will make your point in just the right way. Shuffle slowly and avoid eye contact. You’ll be fine. Run diagonally downhill. I’ve heard bears can’t do that. I just read a DNR report about our low deer herd. People are very upset about the abundance of wolves and bears up here, so the DNR was estimating how many deer the bears eat every year. Does it not seem a bit disturbing that the bear kill 33,000 deer a year? I’ll bet the deer avoid eye contact too!